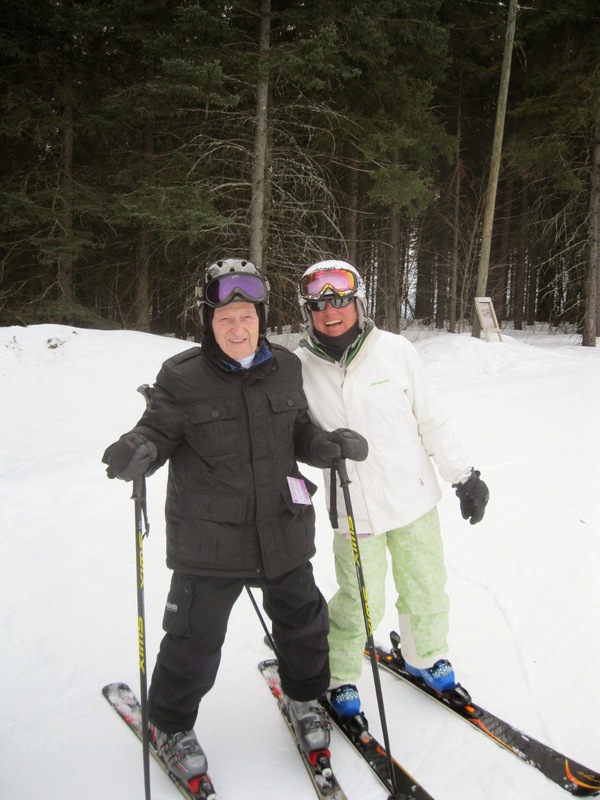 Dean the the Tough Old Geezer Skiers of Greek Peak celebrated his 95th birthday on the slopes today. With wife Nita and daughters Linda and Patricia in attendance Pret enjoyed his special day in the spring sunshine with several runs before lunch and had the energy to hit the slopes again for an afternoon run. Pret was all smiles and all of us who have the privilege to know Pret were wearing big grins as well. What a delight share a run with him and his family. Pret was the center of attention and a cadre of observers were vicariously enjoying his celebration. Pret sets the standard of aspiration for all of us geezer skiers! He is truly our hero! All the best to not only a great ski legend, but also one of the finest persons I have ever known. God bless! Patricia, Pret and Linda at the lift. Pret and Linda ready to launch. Linda, Pret and Patricia - mid run photo op.